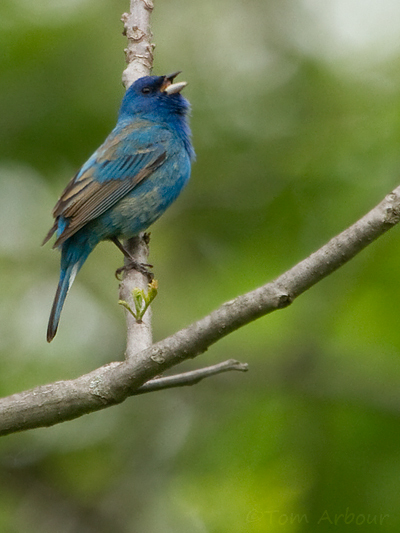 I can remember the first time I had ever heard that the indigo bunting even existed. I was probably in second grade. There was a substitute teacher at Riverview Elementary, Mrs. Johnson, who to my seven year old brain was crazy. I thought she was just totally loopy and I still to this day have never seen anyone whose face was as deeply crimson. You probably were a nice lady Mrs. Johnson, but I lived in fear that you weren't going to get me out of the classroom and out to the right bus. And for a second grader, not getting home to one's family is about the worst case scenario one can imagine. I don't know how I still remember this, but one day in class she just started talking about the "prettiest litttle bluuuuu bird" called an indigo bunting, and she hadn't seen one in a long time. As a second grader, I had never seen one, and don't remember my first encounter, but I'll never forget Mrs. Johnson. This morning while walking along the Olentangy River in Worthington, several indigo buntings were calling from the edge of the woods. This species likes edges and shrubby areas. If you'd like to see them, head to the Worthington Olentangy Parklands or check around old fields and scrubby habitats near you. Hello, the Indigo Bunting is a beautiful bird. Great shot. BTW, If I lived close to Magee Marsh I would be there all the time. Happy birding and thanks for visiting my blog. You're welcome Eileen- I found it through twitter! The birds will die down pretty soon, but it's a pretty cool place. One of Ohio's gems, for sure.